The fatal flaw in American policy, Judis shows, can be traced back to the Truman years. What happened between 1945 and 1949 sealed the fate of the Middle East for the remainder of the century. As a result, understanding that period holds the key to explaining almost everything that follows—right down to George W. Bush’s unsuccessful and ill-conceived effort to win peace through holding elections among the Palestinians, and Barack Obama’s failed attempt to bring both parties to the negotiating table. A provocative narrative history animated by a strong analytical and moral perspective, and peopled by colorful and outsized personalities and politics, Genesis offers a fresh look at these critical postwar years, arguing that if we can understand how this stalemate originated, we will be better positioned to help end it. This is not a review of the book, but of a single page, page 317. This describes activity in Washington on May 14, 1948, the day on which the State of Israel was declared, and on which President Truman formally recognized the new State. There is a very important aspect to this event that Judis fails to cover: he does not tell us about the borders which Israel specified when the state was created. In fact, he is quite misleading on this topic. Only two sentences mention borders. 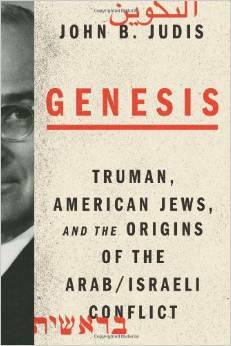 First, Judis says that when Truman’s advisers and the State Department were discussing the recognition of Israel, they decided that they would “recognize the existence of the new state, but not its government or borders”. This puzzling phrase is explained by reading the statement of recognition that Truman issued that evening, which recognizes the government de facto, not de jure, because it was provisional in nature. It says nothing about the borders. This does not mean that the US refused to accept the borders that Israel was claiming: quite the reverse, as explained below. Second, that when David Ben-Gurion [Prime Minister of the Provisional Government] read out the Declaration of Israel’s establishment in Tel-Aviv, he “hoped to enlarge the territory that the UN had alloted [in the Partition Plan of 1947], and did not specify the borders of the new state”. The explanation of this is the following. The Zionist leadership met in Tel-Aviv from May 12 – May 14 to prepare Israel’s Declaration. The initial draft specified the borders according to the UN Partition Plan. Ben-Gurion proposed saying nothing about the borders, because it was his intention to capture territory outside those borders and incorporate it into the state. His view was approved by a narrow majority. On the evening of May 13, he went home and completely rewrote the Declaration, removing all references to the Partition Plan. The next morning, the leadership changed its mind and put the references to the Partition Plan back at the heart of the Declaration. Since the essence of the Plan was the map defining the partition between Jewish and Arab states, Israel’s Declaration implictly defines its borders according to the Plan. That definition was made explict in Washington the same day, as explained below. Judis bases his account on two sources: the memoirs of Clifford Clark, White House Counsel, and the papers of Max Lowenthal, another Truman adviser, who kept a diary of events. He tells us that Clifford had agreed with the State Department that Truman would recognize Israel only if he received a formal request to do so. Clifford telephoned Eliahu Epstein, the representative of the Jewish Agency in Washington asking him to send such a letter. The letter was drafted by Clifford together with David Ginsburg, the Jewish Agency lawyer. Epstein signed it, it was sent to the White House, and Truman issued his statement of recognition. My dear Mr. President: I have the honor to notify you that the State of Israel has been proclaimed as an independent republic within the frontiers approved by the General Assembly of the United Nations in its Resolution of November 29, 1947. There is a facsimile of the letter on the Truman Libray website. It is clear that the USA would not have recognized Israel if it had not declared on the Partition Plan borders. Epstein’s telegram to Shertok makes it clear that Epstein was not able to make contact that day with the leadership in Tel Aviv. His reply to Henderson shows that he had no knowledge of Ben-Gurion’s plan to include captured territory, outside the the partition borders, into the state. Although the Declaration accepted the Partition Plan, Ben-Gurion never intended to stick to those borders. When Israel was declared its forces were already operating outside those borders, so that the subsequent war with the Arab States was as much an aggressive war of expansion against Palestine as it was an attempt by the Arab states to counter the creation of Israel. By the end of the war Israel had illegally taken half of the territory of Palestine outside its declared borders, and refused to give it up or make any territorial concessions. Truman was very angry. He had been deceived. For links to all the relevant documents please see mondoweiss.net/2014/11/documents-borders-palestine. Thanks for pointing out that very important piece of information. And thank you for taking the trouble to thank me. Israel chose to exist. The Arabs chose war instead. Everyone got what they wanted. “Palestine” will never exist. Your post is off topic. Please use this page to comment on the book, not to make general remarks about the topic of the book.